Dentsu was the most acquisitive agency holding company in 2016, according to a new report from agency tracker COMvergence. The mergers and acquisitions report, dubbed RADAR, found that the six major holding companies (WPP, Omnicom, Interpublic, Publicis Group, Dentsu and Havas Group) completed 91 agency acquisitions (defined as at least a 50% stake in the acquired firm) during the year. An additional 25 agencies were bought by four major IT and consulting companies (Accenture Digital, IBM IX, Deloitte Digital and PwC Digital) for a total of 116 acquisitions between the two groups. The acquired firms had total staff of 16,210 and combined revenue of $1.921 billion per the COMvergence analysis. By country, the U.S. was the most active with 23 deals. 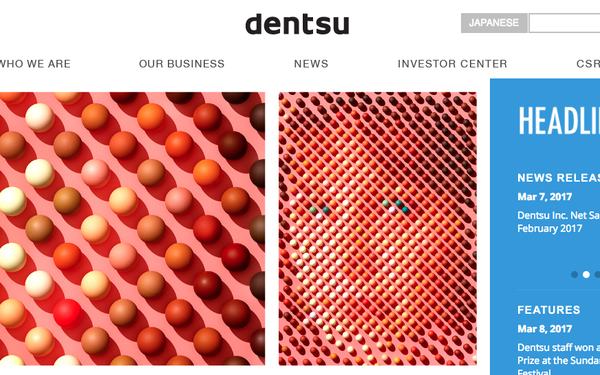 Dentsu made 39 acquisitions. The acquired firms had total headcount of 7,395 and combined revenue of $793 million, per the report. WPP was the second most acquisitive holding company with 30 acquisitions accounting for 3,629 staff and $388 million in revenue. Publicis Groupe scored nine deals with combined staff of 455 and $54 million of revenue. Havas made four deals (210 staff, $26 million in revenue) and Omnicom Group bought three shops (175 staff and $40 million revenue). The biggest deal was Dentsu’s purchase of a majority stake of data and tech-driven marketing shop Merkle Group, with a staff of 3,400 and revenues of $436 million. COMvergence put the price tag at $1.5 billion. WPP’s acquisition of Triad Retail Media was the second largest deal of the year (700 staff and $120 million in revenue). Dentsu also made the third largest holding company deal with its purchase of B2B powerhouse gyro (600 employees and $73 million revenue). However the Accenture Digital deal to buy Japan’s IMJ Corp. was bigger based on the acquired firm’s revenue of $88 million. For most of the holding companies their digital acquisitions focused on strengthening data and analytics capabilities first and to a lesser degree media/activation and creative/production offerings. Publicis Groupe was an exception, per the report, which found that the Groupe’s deals strengthened its Media/activation offering first, followed by data and analytics. Among the IT and consulting firms tracked in the report IBM iX and Accenture Digital were the most acquisitive, each making 7 agency m&a deals during 2016. The combined staff and revenues of the companies acquired by IBM iX were 1,720 and $253 million respectively. The comparable figures for the firms acquired by Accenture were 1,284 and $172 million. COMvergence indicated that data used for the M&A report was sourced from multiple third-party sources including corporate websites and investor presentations from the groups. It follows the release of the firm’s full-year 2016 media agency new business activity report last month.